kc bob: Did Obama really save GM? George Will is one of my favorite conservative writers and pundits. A few weeks ago he framed the takeover of General Motors in a way that might make liberals, I mean progressives, cringe in his piece titled "Liberalism, as we know it". "After a delusional proclamation — General Motors “has come roaring back” — Obama said: “Now I want to do the same thing with manufacturing jobs, not just in the auto industry, but in every industry.” We have been warned. have to reach to enable taxpayers to recover the entire $49.5 billion bailout." The GM takeover and their subsequent performance gives me cause to pause when I hear it used as an achievement of the administration. How can a candidate boast about a deal that has lost taxpayers so much money? Thanks Susan! I appreciate the comment and the FB link! Indeed it's a horrible situation, but what would be the appropriate solution then? Not all industries are like technology industries where it's booming all the time, and employees move freely between companies every year or two in Palo Alto. 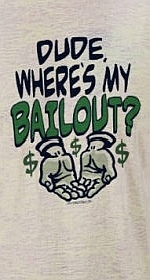 Thanks for stopping by AS D. I am not in favor of corporate bailouts. Seems like they could have gone through bankruptcy proceedings, reorganized and would probably be in a situation similar to today. Except that the American taxpayer would not be on the hook for mega bucks.